This week I am ashamed to say that I learned something I really should have known many years ago! I discovered that our dear friend and partner in Kenya, Michael Mwanika, celebrated his birthday on June 10th! I am ashamed because we have been close friends and coworkers for the Lord since we received his letter requesting help with children’s ministry materials, back in 2004! As his family grew through the years, I have written down the birthdays of his children, but it seems we just never did discuss personal birthdays – there were always too many other things that took precedence! Of course birthdays are often not celebrated as much in Africa as they are in many homes here in the West, and the older one gets, the easier it is to pay less attention to them! But I do want to make a point to praise and thank God for Mike being able to celebrate his 40th with his family!! Yes, he’s now 40 – although his youthful figure, ever-smiling face and exuberant unstoppable energy would never betray it! He is one of those rare people who truly lights up a room when he enters it – and shines the light of Jesus wherever he goes! We love you Mike and are so blessed you are our partner! In spite of it being his birthday this past weekend, he had 2 high school weekend challenges to organize; 2 Sunday services in different high schools to conduct, and a children’s ministry training to teach!! Thankfully the Lord has blessed him with a small team of faithful and gifted coworkers who helped him. 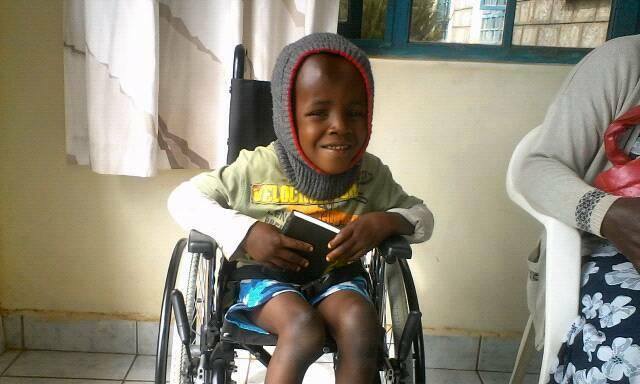 This week he is traveling to Uganda where he has been asked to minister again with Wheels for the World – a wonderful international organization that provides wheelchairs and other mobility aids to disabled people. 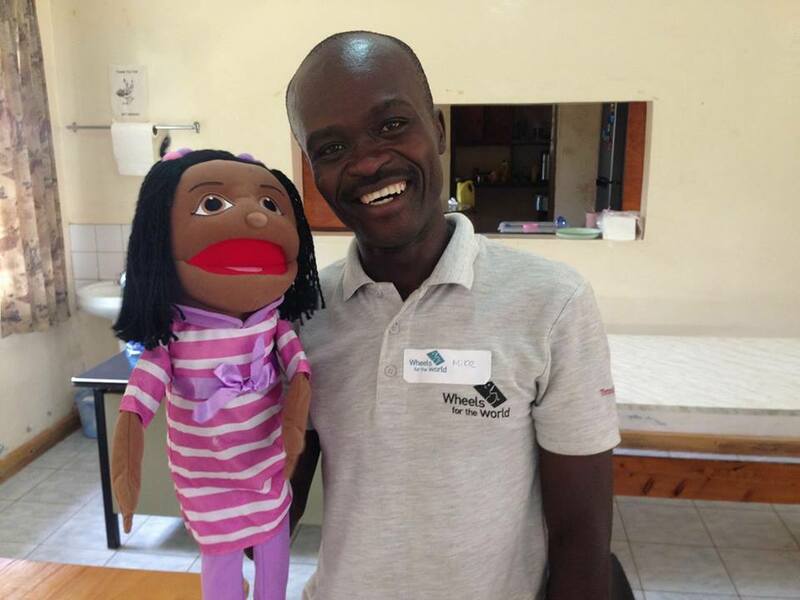 As he does at the monthly mobile clinic for the handicapped, Mike helps entertain with puppets those who are waiting, and shares the joy of Jesus with some of those whose lives are so sadly limited. We heard this week from Pastor Sika in Togo, who asks for special prayer for his little girl, Ann (6), who was in and out of hospital all last week with high fever and vomiting. In spite of medication, she was not getting any better. We do pray that God will quickly heal her and restore her strength. Also Pastor Sika’s aunt just died, and as the family looks to him as the “head” now, he is responsible for organizing the funeral back in the village. We pray that the funeral will be another opportunity for the family and villagers to hear the truth of God’s love and that many will come to accept Christ. Like Mike, Pastor Sika is always busy and really needs to take time to rest more. We pray that God will allow him to have a season of rest and to be able to spend more “fun” time with his family. I know it is hard for him as he has such a burning desire to reach the lost there, especially in the many pagan villages. 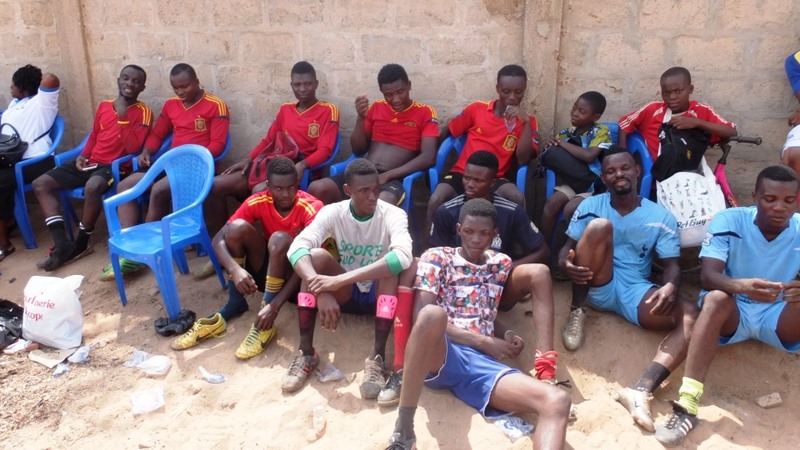 In Lomé, he has developed an outreach program with his church to share Jesus through playing soccer – much loved by many young people in Africa! The photo below shows such fellowship evangelism in action. 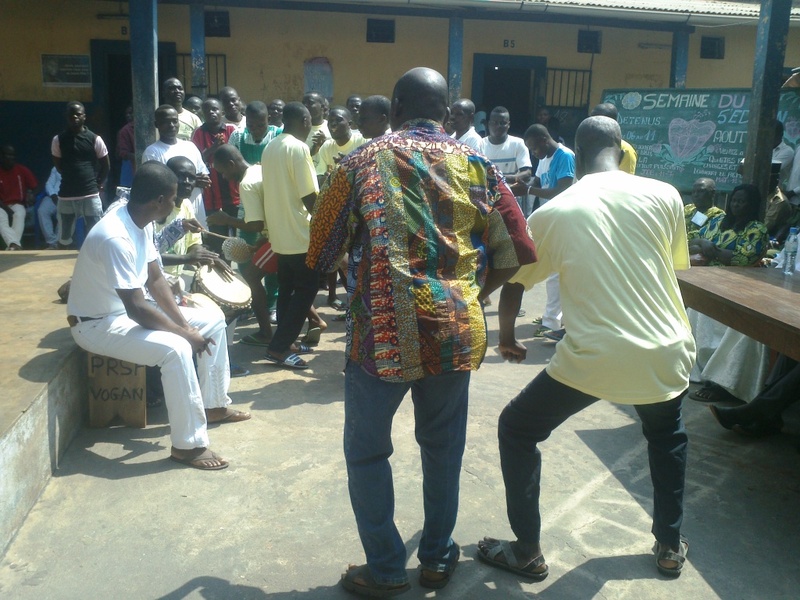 He and his team are also busy ministering in prisons, as seen in the photo below, where inmates (and guards) enjoy praise and worship in a service. The prison ministry does not just consist of visiting prisons to preach the Gospel, teach bible studies and minister to the inmates. Food and other needed items are taken in (as prison authorities there supply very little); time is also spent with the guards and prison authorities; and of course help is also given to those inmates whose lives have been changed as they seek to serve Christ even after their release. This photo shows Brother Senyo and Brother Toussaint, both of whom have a proven calling to both prison ministry and ministry in schools. 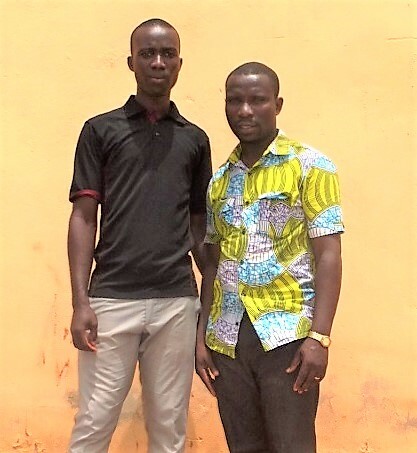 They also help with church planting and Pastor Sika is praying for special monthly support of $200 for each of them to be able to minister full time on his team. If you or your church would like to help with their support, please contact us.